CPC's work in Flushing, Queens dates back to the early 1980s, when Asian families began to migrate in large numbers from Manhattan's Chinatown. Our services have since expanded alongside the growing Asian community in Queens. CPC currently provides early childhood services, school-age child care services, education and career services, adult literacy, senior services and community services in Queens. Keeping pace with ever-increasing community needs required CPC to expand rapidly throughout the years, and as a result we soon outgrew the available space we had for our Queens staff and constituents. Our programs needed a permanent home where all community members could access the full range of services we offer. This led CPC to create the Queens Community Center in Flushing - our new neighborhood service hub. 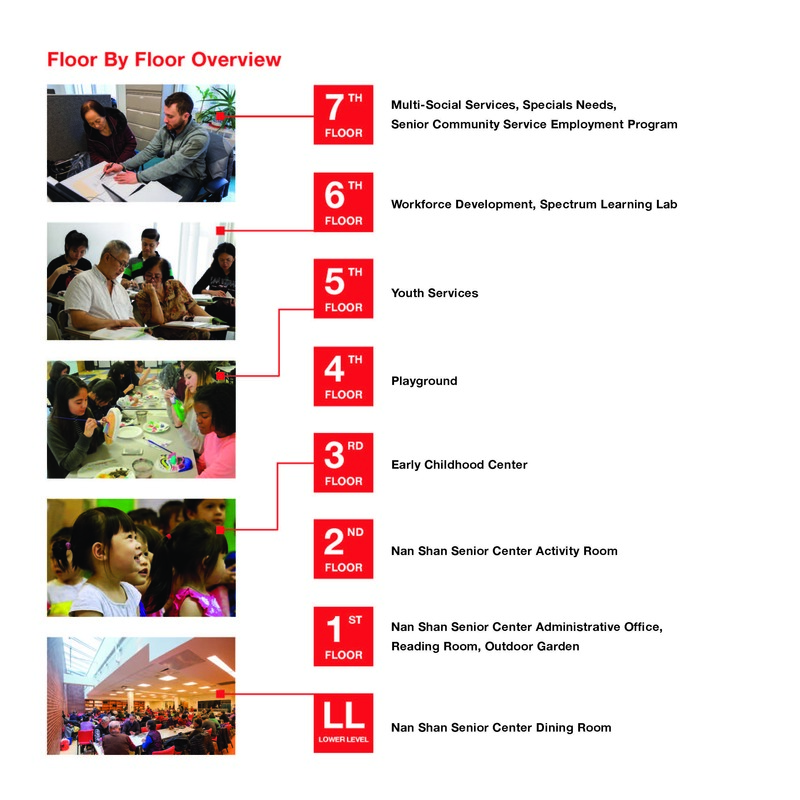 The dynamic community center offers 20,640 square feet of multi-purpose space spanning ten floors, with innovative features such as an outdoor garden and an open-air playground on the 4th floor. There are classroom spaces for education and career services and community services trainings and enrichment programs, a three-story senior center, an early childhood center, an office space where our administrative and program staff can work together on behalf of the community. 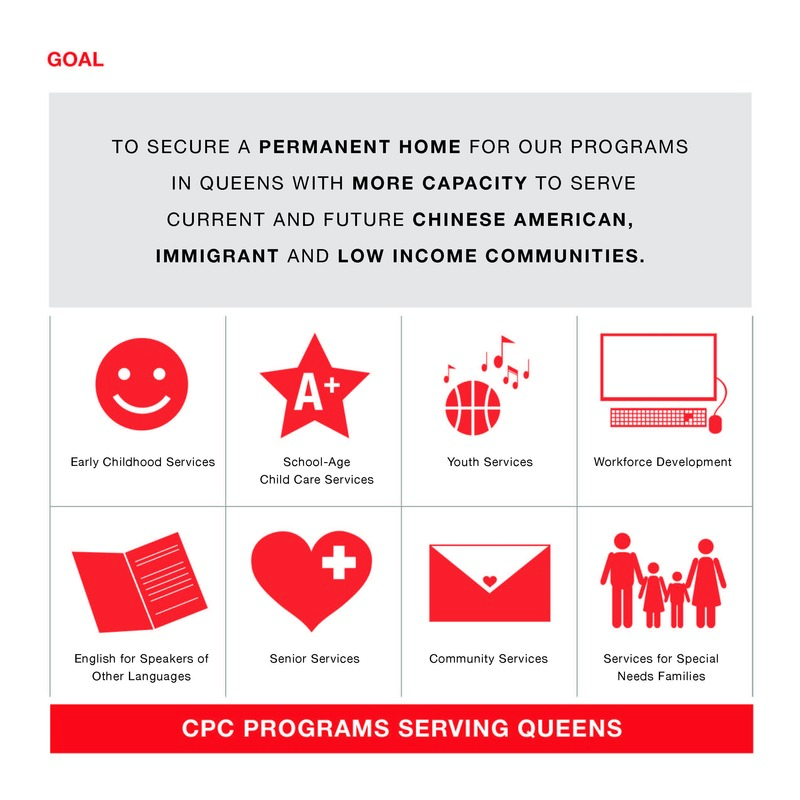 Support CPC's vision for Queens - Ensuring all families are supported and successful. The gift of naming is a meaningful opportunity to directly impact the development and betterment of the Asian, immigrant and low-income community in New York City. Your support will empower the next generation and promote social and economic empowerment of Chinese American, immigrant and low-income communities. For more information on the CPC Queens Naming Campaign and payment plans* please contact Mabel Long at 212-941-0920 x.140 or mlong@cpc-nyc.org. *Cash or Check made payable to the "Chinese-American Planning Council, Inc." are accepted. Donate using a credit card or PayPal.